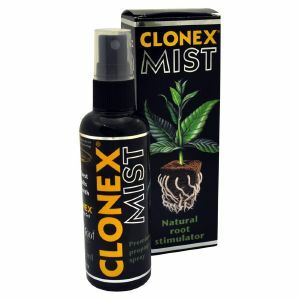 Clonex Mist is a unique foliar additive designed for propagation purposes that has been proven to contribute towards exceptional results when used in conjunction with the hugely popular and mightily effective Clonex Gel. Liberally spraying the product over your mother plant several times during the final weeks before taking cuttings serves as a good preparatory measure, working to ensure the new growth areas remain vibrant. Then simply mist the clones right before they are put into a propagator and every 2-3 days afterwards until initial roots form - you’ll find there are genuine benefits to be gained from such a move! Firstly it helps to significantly speed up rooting times so that you can often transplant your plants 25% earlier than normal. And secondly the roots inherit the potential to outgrow untreated ones by as much as 30%, with an increased density of up to 156%... incredible! This all combines to make the cuttings stronger, healthier and more suitably primed for future development! 100% safe and completely non-toxic, Clonex Mist is a well-researched mix of natural minerals and amino acids supplied in a 100ml instant application spray bottle. Illustrated manufacturer instructions are also included to show you how to deploy the product during the early stages propagation.